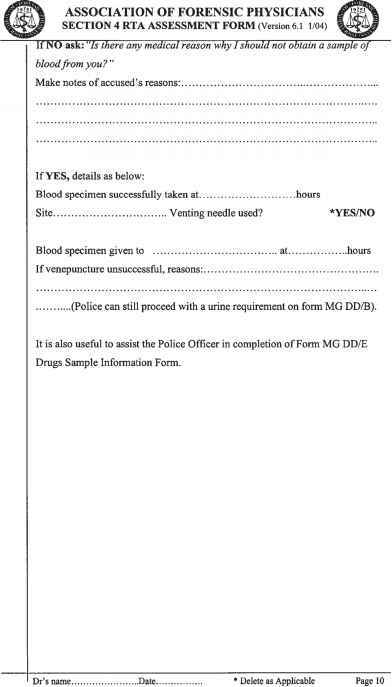 Note: This form has been designed by Dr Ian F Wall on behalf of the Education and Research Committee of the Association of Police Surgeons for use by Police Surgeons (also known as Forensic Medical Examiners or Forensic Physicians) who have been trained in the use of Standardised Impairment Tests, The form is provided to assist Police Surgeons in determining whether a person has a condition, which may be due to drink or drugs and not necessarily due to impairment, It is to be regarded as an aide-memoire and it is therefore not necessary for all parts of the form to be completed. Some details are included so as to aid possible subsequent assessment of fitness for detention in custody. 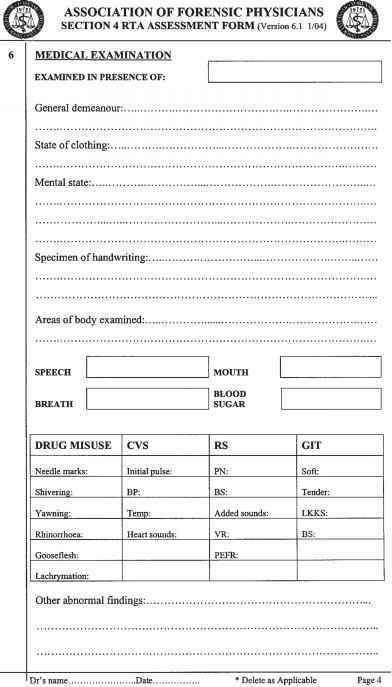 Where a test is abandoned the reasons should be recorded in Additional Particulars at 12, If the questions are read from a card, the wording should be identical to those used in this form and the card must remain available for production at court. 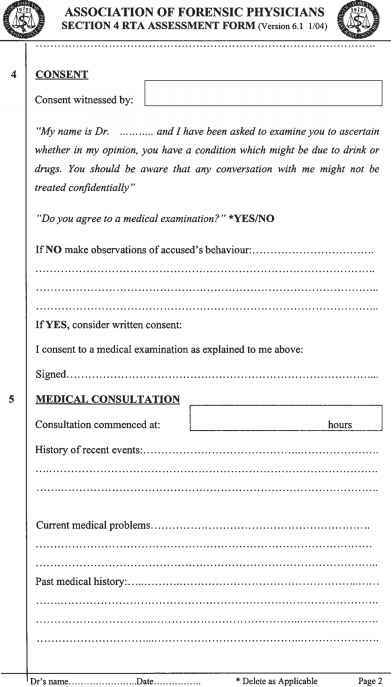 On completion this form is the personal property of the examining doctor. 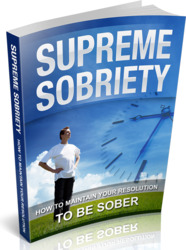 Alcohol intake and times in last 24 hours:. Relevant educational history (to assess if learning disability etc):. 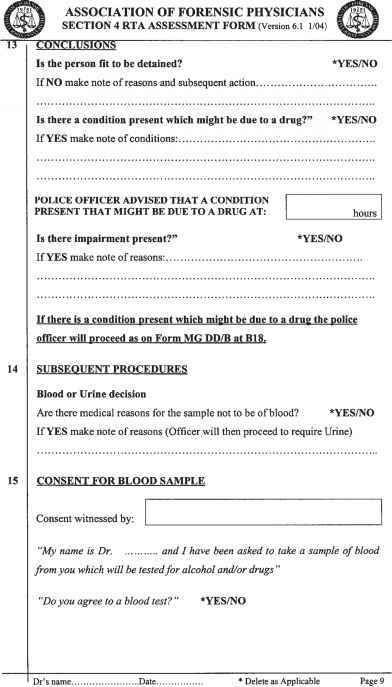 "I would like you to perform a series of tests to enable me to ascertain whether you have a condition which might be due to drink or drugs, or whether your ability to drive is impaired by drink or drugs. 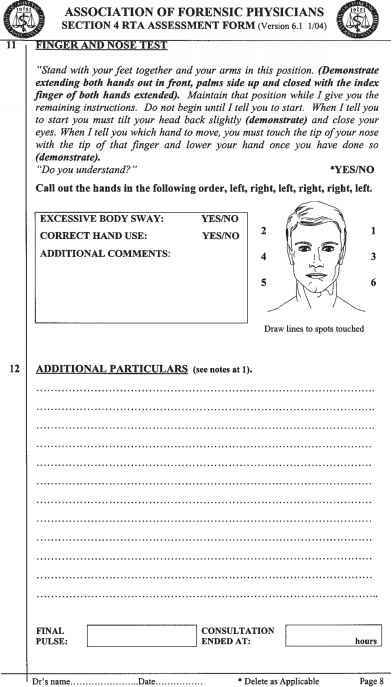 The tests are simple and part of my evaluation will be based on your ability to follow instructions. If you do not understand any of the instructions, please tell me so that I can clarify them. " "Stand up straight with your feet together and your arms down by your sides. Maintain that position while I give you the remaining instructions. 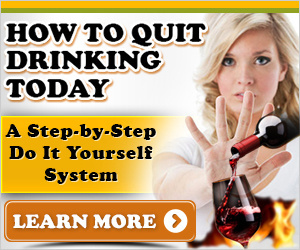 Do not begin until I tell you to do so. When I tell you to start, you must tilt your head back slightly and close your eyes (demonstrate but do not close your eyes). Keep your head tilted backwards with your eyes closed until you think that 30 seconds have passed, then bring your head forward and say 'Stop'". Identify a real or imaginary line. "Place your left foot on the line. Place your right foot on the line in front of your left touching heel to toe (demonstrate). Put your arms down by your sides and keep them there throughout the entire test. Maintain that position whilst I give you the remaining instructions". "When I say start, you must take nine heel to toe steps along the line. On each step the heel of the foot must be placed against the toe of the other foot (demonstrate). When the ninth step has been taken, you must leave the front foot on the line and turn around using a series of small steps with the other foot. After turning you must take another nine heel to toe steps along the line. You must watch your feet at all times and count each step out loud. Once you start walking do not stop until you have completed the test".